Hosley Set of 4 - 12.5" High Botanical Diffuser Replacement Reed Sticks- Elegantly Hand Carved Fan Shape Great Decor. Ideal Gift for Wedding, Party, DIY, Crafting, Reiki, Chakra, Spa, Aromatherapy. Use with Hosley diffuser oils only. 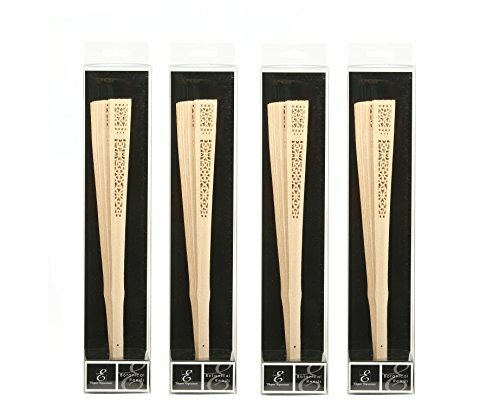 PRODUCT: Hosley Set of 4 - 12.5" High Botanical Diffuser Replacement Reed Sticks - Hand Carved Fan Shape. USE: These are perfect for adding a decorative touch to any room's decor. Designed to perk up your favorite diffuser paired with Hosley's diffuser oils to beautify fragrance into the air. Perfect for everyday use, wedding, events, aromatherapy,Spa, Reiki, Meditation, Bathroom setting. BENEFITS: Bring a luscious, beautiful aroma to your home with our Hosley signature scented diffuser oils and a pretty glass bottle for worry-free home fragrance. This Diffuser Reeds will last the duration of most events. Once the event is done, these low cost solutions are easily disposable or can be reused for you next event. When using in your home as a decorative and fragrance accent. MEASUREMENTS/MATERIAL: Each one measures 2.56" x 2.00" x 12.50", set of 4, and made from hand carved wood.